Although many electrochemical reactions are reversible in theory, few are suitable for a practical storage battery, which will be required to cycle hundreds of times between charging and discharging currents of 1-100 A or more. The most widely used storage battery is the lead acid battery, invented by Planté in 1860 and continuously developed since. Figure 16.3 Schematic diagram of lead acid cell. The charge carriers move in the direction shown during the discharge reactions (16.10) and (16.11). The reactions and carrier movements are reversed during charging (switch SI open and S2 closed). Thus PbSO4 replaces the PbO2 in that plate, with similar, but less disruptive, mechanical effects than in the negative plate. 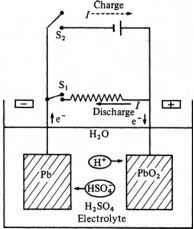 The electrical current through the solution is carried by H+ and HSO— ions from the sulphuric acid electrolyte, which themselves take part in the plate reactions. Transportable 'gelled cells' have this electrolyte immobilised in pyrogenic silica, with the fibrous glass mat separator giving open gas paths for the release of hydrogen and oxygen in overcharge. Although this makes them relatively expensive, they are safer to use and transport, since there is no danger of spilling highly corrosive sulphuric acid, and are 'maintenance free'. Knowing the reactions involved and the corresponding standard electrode potentials (given in chemical tables), the theoretical energy density of any proposed battery can be calculated. Figure 16.4 Operating characteristics of a typical lead acid battery (SLI type of about 100 Ah nominal capacity). (a) Discharge. The curves are labelled by the discharge current (assumed steady) and by the time taken to 'fully' discharge at that current. (b) Charge. The curve is for charging at a constant low current. (c) Density of electrolyte as function of state of charge. After Crompton (2000). The electrode potential, under standard conditions of concentration, for (Pb/PbSO4) is 0.30V and for (PbSO4/Pb+) is -1.62V. So the theoretical cell-EMF at standard conditions for (Pb/PbSO4/H2SO4/PbSO4/PbO2) is fcell = +1.92V, with the PbO2 plate positive, according to the IUPAC sign convention. The actual cell EMF depends on the concentration of reagents, and can be calculated by standard electrochemical methods. In general, the open-circuit voltage of a cell differs by only a few per cent from the theoretical cell voltage (Figure 16.4). In particular, lead acid batteries are produced at open-circuit potential difference of 2.0 V per cell. If the internal resistance of the cell is much less than that of the external load (as can be expected with a new or 'good' cell), then the potential difference across the terminals will be close to the open-circuit value. Unfortunately, the energy density Wm of any practical battery is always much less than the theoretical value Wm(0) based on the total active mass, as explained below for lead acid batteries. Therefore most commercial batteries have Wm - 0.15Wm(0), although more careful (and more expensive!) designs can reasonably be expected to achieve energy densities up to 25% of the theoretical values. 1 A working battery necessarily contains non-active materials, e.g. the case, the separators (which prevent the electrodes short-circuiting) and the water in which the acid is dissolved. Moreover, the acid concentration must not be too large, since the battery would then discharge itself. Since the mass of actual battery contents exceeds the mass of the active ingredients, the energy density based on the mass of the whole battery is less than the theoretical value based on the active mass alone. However, this factor is not of great importance for stationary batteries. 2 The reactions cannot be allowed to go to completion. If all the lead were consumed by reaction (16.10) there would be no electrode left for the reverse reaction to operate, i.e. the battery could not be cycled. Similarly, if the concentration of H2SO4 is allowed to reduce too much, the electrolyte ceases to be an adequate conductor. 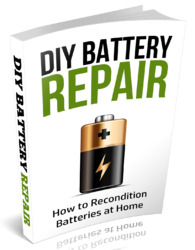 In practice, many battery types should not be allowed to discharge more than about 50% of total potential stored energy, or they may be ruined. However, specially designed batteries do allow 'deep discharge' beyond 50%. 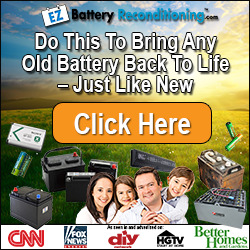 A further limitation of real batteries is familiar to all motor vehicle owners: they do not last forever. Solid Pb is almost twice as dense as the PbSO4 found in the discharge reaction (16.10). Therefore it is difficult to fit the PbSO4 crystals into the space originally occupied by the Pb paste in the negative electrode. After many charge/discharge cycles, the repeated expansion and contraction causes plate material and some PbSO4 to fall to the bottom of the cell. This constitutes an irreversible loss of active material. This loss is worse if the battery is allowed to fully discharge; indeed, it may rapidly become impossible to recharge the battery. In addition, the 'shed' material may provide an electrically conducting link between plates, so increasing 'self-discharge'. Storage batteries should have a generous space below the plates so debris can accumulate without short-circuiting the electrodes. which also slowly, but irreversibly, removes active material from the battery. Thus batteries designed for use with motor vehicles do not usually perform well in photovoltaic and wind-power systems. Batteries for stationary applications, e.g. photovoltaic lighting systems, can use Sb-free plates, and have longer life (usually at least 8 y and perhaps as long as 20 y), but only if charged in a controlled manner and if not excessively and frequently discharged. The performance of a battery depends on the current at which it is charged and discharged, and the depth to which it is regularly discharged. Figure 16.4(a) shows the discharge characteristics of a typical lead acid car battery. Its nominal capacity is Q20 = 100 Ah, which is the charge which can be extracted if it is discharged at a constant current over 20 h (usually labelled I20). The voltage per cell of a new battery during this discharge should drop only slightly from 2.07 to 1.97 V, as the first 60% of Q20 is discharged. This discharge removes dense HSO- ions from the electrolyte solution, and stores them as solid PbSO4 in the electrodes, by reactions (16.10) and (16.11), thereby reducing the density of the electrolyte solution as in Figure 16.4(c). Thus the density of the 'battery acid', measured with a hydrometer, can be used as a measure of the state of charge of the battery. If the same battery is discharged between the same voltages over about 1 h, its voltage drops much more sharply, and the total charge which can be removed from it may be only about 0.5Q20. This is because the rate of reaction of the electrodes is limited by the rate at which the reactants can diffuse into contact with each other. A rapid build-up of reaction products (PbSO4 in particular) can block this contact. Moreover the internal resistance across this PbSO4 layer reduces the voltage available from the cell. A set of charging characteristics for the same battery is shown in Figure 16.4 (b). To commence charging, an EMF of at least 2.1V per cell is required. The voltage required initially increases slowly but increases rapidly to about 2.6 V per cell as the battery nears full charge (if constant charging current is maintained). This is because the water in the cell begins to electrolyse. When the cell is overcharged, H2 gas will be released. Such 'bubbling' can benefit the battery by mixing the electrolyte and so lessening battery stratification; indeed sophisticated charge controllers arrange for this to happen periodically. However, excessive gas release from the electrolysis requires the electrolyte to be 'topped up' with distilled water, and the emitted H2 may produce an explosive mixture with air and so has to be ducted away. Sealed batteries - sometimes sold as 'maintenance free' - have a catalyst in the top of the battery over which electrolysed hydrogen can combine with oxygen to reform water within the battery casing, so that 'topping up' the electrolyte with distilled water is not necessary. Extreme overcharging may cause mechanical damage within the cell and may raise the concentration of acid to the point where the ions are not mobile enough to allow the battery to work. Many cycles of mild charging and discharging, e.g. as in small photovoltaic power systems, cause large PbSO4 crystals to develop within the plates and effectively remove active material, as well as causing mechanical damage. In such conditions, occasional deep-discharging may reactivate the battery. The overall lesson is that charge/discharge control is essential for long battery life; at least charging at constant voltage and at best having a sophisticated controller allowing occasional de-stratification bubbling, controlled charging and discharging currents, voltage cut-offs and, perhaps, occasional deep-discharging. A good battery has extremely small internal impedance (<0.1 Q) and is capable of delivering large currents at high frequency. The 'farad capacity' is very small, despite the 'charge capacity' being large, so do not be misled by the two distinct meanings of the word 'capacity'. Development of improved lead acid batteries still continues, producing a variety of models with performance optimised for different applications, in terms of reliability, long life, cost, power/weight ratio, etc. Key developments over the last few decades include polypropylene for inert leak-proof enclosures, 'absorbent glass mat' technology for plate separators, valve regulated lead acid batteries (sealed to prevent air ingress but allowing excess gas to escape and having internal reformation of overcharge electrolysed hydrogen and oxygen), and a wide range of 'recipes' with small concentration additives for specialist plates and separators and electronically controlled charging. Is lead acid a renewable reasource?